A few months ago, I went to an event here in D.C. with Anne-Marie Slaughter, author of the often-talked-about article in The Atlantic, Why Women Can&apos;t Have It All. The venue was packed with women in their 20s and 30s, ambitious women who were trying to figure out how they&apos;d manage to have a family while still growing their career. And while most of the conversation that evening was about increasingly cliche topics we&apos;ve talked circles around since Slaughter&apos;s article came out, one new-to-me point came up that got me thinking – and has kept me thinking ever since. I don&apos;t remember Slaughter&apos;s answer, because my mind never left the question. That question made me realize something I hadn&apos;t realized before. It made me realize I HAD that flexibility, the kind the woman was asking about. It made me realize I had created a flexible career, one that would be conducive to raising a family – without meaning to. I created my own business for lots of other reasons, but now I saw just how much I&apos;d set myself up to have a family, too. A family has always been in my plans. I&apos;ve always wanted kids, ever since I was a kid myself. And the truth is, I never expected to wait this long to have them. But, of course, you can&apos;t have children without a partner to have them with. Well, you could, but that&apos;s not how I envision myself doing it. And while most of my friends were meeting that special person, getting married, settling down in a city or town and having kids, I was moving across the country for a job, leaving that job to travel in Africa, moving in with my parents so I could write a book, then moving to a different city for a job, working evenings and weekends to grow my business, and finally leaving that job to pursue my business full time. Perhaps not as conducive to finding my spouse. Or perhaps MORE conducive to finding the right person, since I do believe that living your life the way you want to will result in meeting that person along the way. Now that I have found the right person, he&apos;s as into globe-trotting and adventure-seeking as I am. My point here though, is that I&apos;m 32 and don&apos;t yet have kids – unlike almost all of my close friends. And I did not see that coming. I didn&apos;t see it coming until I graduated from journalism school and fell in love with my career – and continued to love it even as it morphed into a totally new creature (yet another diversion I didn&apos;t expect). What I never did purposely was create a career that would allow me to focus on having my own family without giving up my work life. Yet now that&apos;s so clearly a benefit of having my own business that I wish I&apos;d been smart enough to set it up with that goal in mind. This topic – of being a woman in today&apos;s changing workplace, of figuring out how to fit in a personal life while building my career – isn&apos;t one I write about a lot on this blog. I avoid it because it&apos;s complicated, and because I&apos;m not sure whether readers will care, and because sometimes I&apos;m not even sure what I think or the best way to share those ideas. But lately it comes to the surface more and more. Like when I met with a reader of this blog, and she pointed out that I&apos;m one of the few women who writes about running an online business, one of the few female voices in this space. And when super-smart posts are popping up about how women should create their own rules in the workplace. And when members of this community share their own tips for being a mommy while kicking it in the freelance world. And when I feel my own family-work challenge approaching in a very real way, one that will eventually affect my business and this blog. So now I&apos;m at the point where I&apos;d normally delete this post and save the topic for later, because this has no obvious message, no overarching point. And I think, why did I write it to begin with? Here&apos;s the reason: to see if you, too, are figuring this out, are working through how to have it all. 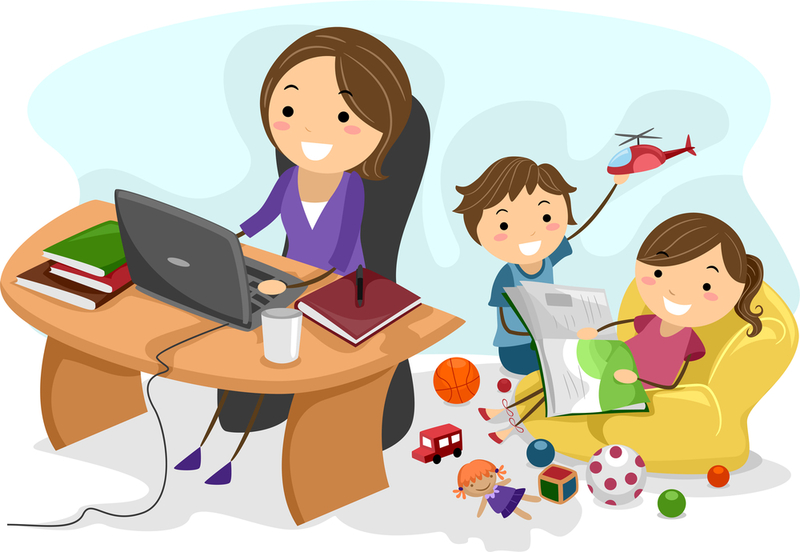 Hi, I am an expat mom in Dubai, working 6 days a week, full time. I also have two kids (9 year old girl and 15 months old boy). The image in this post about working at home while watching the kids got to me because I’ve contemplated doing that as advised by friends after I had baby #2. But after thinking about it a lot, I know it won’t work for me. And I don’t think it is easy for other moms as well. Something’s gotta give. Awesome post!!! Now, you just gotta work on the romantic part of your life, so you can have the life you always dreamed of! 🙂 I too have created the perfect flexible career to have children. We’re going to start trying for our first soon! You make a good point, one that I haven’t even thought of. I would love to have kids one day, but I never thought how work and family would work after I had my kids. Since I am a teacher, I think having those hours might work for me once the children are in school. I have considered starting a business (a franchise), but am worried that once children are it the picture, I would not want to NOT be there for children if business obligations come up. I’m still trying to figure out what will give me the most satisfaction first, then go from there. Yes! As a 29 year old who also took a non traditional path that led to getting married last summer,how children will fit is one of my biggest questions. I dream of creating the flexibility you mention, but havent yet figured out how. Stories like yours are inspiring, though. Thank you. Thanks for sharing! This is something I’ve been thinking about a lot – just got married and, after spending the better part of the past year living off my husband’s salary so I could write, I’m now searching for a steady income job in a new industry. But where does that leave me when it comes to having kids? The idea of starting a new career and then going on maternity leave within a year (my ideal timeline given a variety of factors) is stressful. We keep talking about ways we can make ends meet if I don’t go the traditional job route, but it’s so hard when you want to do grownup things like own a house, pay off your debt, and start a family. It’s encouraging to see that there are women who have found ways to make it work – that it is possible to have both a rewarding career and a family. Hey Megan — That’s a really good point: you don’t get maternity leave when you work for yourself! And I do think it takes a while (maybe more than a year?) to build up this type of business that you can really count on for income, especially if you need to scale back when you have your first baby. Let us know what you decide! I find the concept of “having it all” to be frustrating and it sets women and mothers up to fail. I think you can find a balance that works for you and your family but not many women can “have it all”. Life and being a mom consists of trade-offs. There are days where I’d love to freelance or have the option to work from home all the time, but my current job gives me stability, steady income, and health insurance. Rather than lament on what I don’t have, I’m satisfied to be able to provide those things for my family. When the time comes when I decide I need to do something differently in my career, I will make the choice with the understanding that it may be at the expense of something else (stability, time with my family, etc.). I definitely think about this! It’s one big reason I want to keep writing and gaining more freelance work — I think it’d be a great career to have once I have kids. And I feel like a TOTAL weirdo saying that, seeing as I don’t even have a boyfriend, but I know that it’s in my future… man or no man! I think it’s cool that women today have so much more freedom and flexibility to create their own careers. And with the help of women like you, hopefully they’ll be inspired enough to make it happen! I’m 28 and just had a sit down with one of my best friends who is presently sending off her applications to journalism school. The truth is, we want more time to focus on ourselves, to grow up and grow our careers before having children. The reality is that we don’t want to take the risks older mothers do when facing fertility treatments, higher chances of children born with disabilities and raising children without their grandparents. Yes, we want to ‘have it all,’ but we’re realizing we also have to prioritize. At this point, my eyes are open, but I’m still facing some resistance to accepting these realities. I know I can’t wait around for destiny to bring me my life partner, so I’m making some conscious decisions to put myself out there in the dating world and open myself up to the possibility of both growing a family while growing my business. In sum, yu have NO IDEA how timely this blog was today Alex. On point. Don’t delete, just post and get the feedback! Yes. Working it out. And it’s working. But … and it’s a big but … we moved to Laos and the cost of living is low low low here. That helps with housekeeping and child care. Yet another brilliant idea here — move to a place where your money goes a long way 🙂 You are a perfect example of succeeding at this, so thanks for chiming in! I love this! Sometimes it feels like we really can’t win. I am lucky enough to be getting married in the next year and may want to get knocked up in 2 or 3 years but I’m terrified about what that will do to my freelance writing career that I love so much. I have a hard enough time concentrating now without a screaming baby in the vicinity. After three-plus years working in the magazine field in NYC and freelancing on the side, I moved to Colorado to get married and start freelancing full-time for this very reason. My husband and I are expecting twins any day now, and though I have a steady group of great clients, I’m still nervous taking the next few months off to focus on the babies. It’s what I want, but I also worry that getting back in the game will be tough. I have already encountered a fair amount of client “squirreliness” surrounding my pregnancy, so much so that newer ones don’t even know I’m about to be a mom. So even when you line things up to go just how you want, there are still obstacles amidst the flexibility and self-created maternity leave that leave me wondering how this will all pan out. So true. And we can’t anticipate all the obstacles anyhow, so sometimes it just makes sense to take it as it comes… TWINS! CONGRATS! I started figuring out ways to make money from home back in college but I am kicking myself for not really going all the way with it until after I had three kids. It has been challenging and it gets a little easier the older they are but I do wish I had figured it out before they came along. Alexis. I’m glad you didn’t delete this post. As a mother-to-be who is also in-between careers (i.e. finishing grad school in a creative writing program), I completely understand the sheer terror of having a baby before you feel like everything is in place, job-wise. In my case, reality stepped in: I’m 34 and my partner’s 37, and she desperately wanted to get pregnant. So I agreed to start a family with her before I myself had decided that I was “ready.” Now that this is a reality, though, I am a lot less freaked out than I thought I would be. In fact, I find myself remembering all the women in my life, including my mother, who started second, successful careers while or after having babies. Sarah — So glad you brought this up, because I really think it’s NEVER the right time, you’ll NEVER FEEL ready! But the truth is, you ARE ready, and things will fall into place 🙂 You’re going to be a great mom! Great post! And, thanks for the link. I launched my full-time freelance career when my son was 15 months old. I had freelanced on the side for a few years before that, but in hindsight, I would have done more to lay the groundwork before I made the switch. Even so, I did it and it has been a success. I also managed “maternity leave” when my daughter was born two years ago. I decided to slow down during her first few months, but continued working on projects for my key clients. I found a balance that worked, even with a toddler and newborn. While it would have been nice to completely shut down from the outside world for a few months, the tradeoff meant that I kept my clients happy and have better long-term flexibility because of it. Also, infants sleep a lot, so the key is taking advantage of small pockets of time. I love reading about all this and your blog. I’m facing redeployment or more likely redundancy from a full-time job right now. Amongst standard ups and downs of life, my 3 year old’s birthday, funeral Monday for friend’s 3 year old who lost their fight for cancer, and so on, I’ve decided to ideally keep a steady income by working, whilst starting up writing/ a blog on the side on female entrepreneurship, experimenting with the many unsung ‘fractional entrepreneurs’ who seem to be everywhere, not to mention young people and graduates doing their own thing now. It all helps me get a little less scared of doing new things for myself. Really interesting post and comments which arrived at such a pertinent time for me. I’m in a similar situation which I thought was a bit by chance rather than planning but now seems very fortunate. I’ve worked in the same company but different roles for the last 12 years (with a year off to go backpacking) and really enjoyed my time there. At 33 I met my now husband and I was never that sure about wether i wanted a baby but i decided to give it a go and at 36 I got pregnant. Because of the nature of my work I got a really good maternity package which had enabled me to spend a really good amount of time with my daughter as she’s growing up (she’s 8.5 months now). I’ve been thinking of returning to work for a couple of months now and have been doing some planning and networking. I’ve decided that I’d get greater satisfaction and flexibility by working for myself so I’ve now set up my own company to go freelancing and am in the process of getting clients and writing my website. Whilst this is the ‘scarier’ option for me, having worked in the same company pretty much my whole life, I feel that now is the right time. So reading this post made me realise how lucky I’ve been that I enjoyed my job, I got some really good training and qualifications during that time which I can now use in the future and I got a good maternity leave. I also think the flexibility comes not only from experience and qualifications but also from attitude. Having spent all my time in one company, the biggest shift for me is needed in attitude and confidence to let go of the safety net (and some of the negative stuff that comes from working in a large corporation) and have the confidence and change in value required to work for myself. I’ve been using some of the NLP techniques I did during my training to achieve this, so I’ve hopefully now got the flexibility and confidence to go it alone which I feel will create a better life for me and my daugher. From another view I would also argue that women should (if they wish) create a flexible career regardless I wether they want to have kids or not as flexibility can often give you more choices. I’m 44 with three teens and I have been working independently for over twenty years. Many years ago I decided to have my kids relatively early (27) and then go back into the corporate world when they were bigger, but I never did get there. Thing is once you figure out how to have kids and work in balance you never want to give up that independence. It’s not just good for a short time whilst kids are little but can work brilliantly when they’re teens and arguably need you around just as much. I love that you’re writing about this, because this issue is relevant no matter the content of a woman’s blog or career. It’s an important discussion to have, both to raise this conversation among women, and also to elevate the need for more balanced approaches to work/life integration to employers and policymakers. The thing is, while this approach may seem innovative, it actually is becoming more and more common as women opt out of the traditional workforce that doesn’t serve them. My entrepreneurship has been a means to an end – the end being a way to have work and family – but it is not easy and requires a lot of discipline. You are right – you’ve set yourself up on a great path, and you are generous about sharing your strategies with other people – men and women. I look forward to you reaping the rewards! I do believe in being flexible, allowing for change and reviewing goals to make sure they fit what you actually want. Because what I want now — married, living as an expat with a 10yo and another baby on the way — is infinitely different from what I wanted when I was 23 and living in Brooklyn, even though I’ve worked as a freelancer throughout all situations. I started my own business back in September 2013. Now I’m working toward developing passive income so that when this baby arrives in May, I can take off a month or so without worrying (too much). Beyond that, I have a list of products, classes and books I want to develop and write. They’re also all prioritized. Will I stick to my current plan 100%? Probably not. It does, however, help to have a road map to follow, knowing that I am welcome to tweak and change as I need. I’d also like to add that there is a certain comfort in talking and acting as if I have it all figured out even though I’m fully aware there are many variables. Holding the belief that you are capable and strong enough to work through things and figure things out as need be is absolutely priceless.